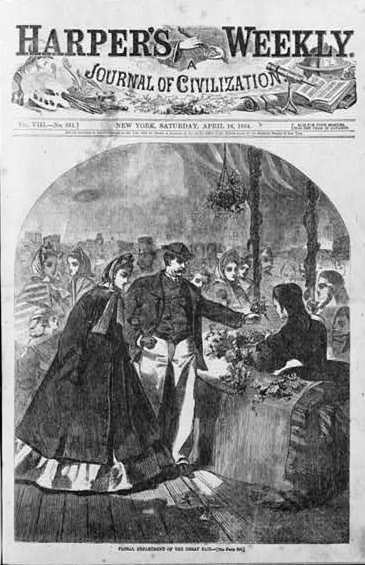 The Metropolitan Fair, [in New York] which opened on the 4th [April, 1864] instant is in every respect a demonstration worthy of the large-hearted and patriotic benevolence of the commercial metropolis of the country. Perhaps the most clever solicitation was made by the organizer of the Chicago Fair to Abraham Lincoln. It was suggested that the original draft of the Emancipation Proclamation would be a prestigious donation, giving credibility to the fair. "There would seem great appropriateness in this gift to Chicago & Illinois, for the benefit of Western soldiers, coming as it would from a Western President." The overwhelming success of the Chicago fair inspired women all over the North, and even the South, to attempt its imitation, and fairs to support the war effort were organized in many small towns and large cities throughout the northeast. 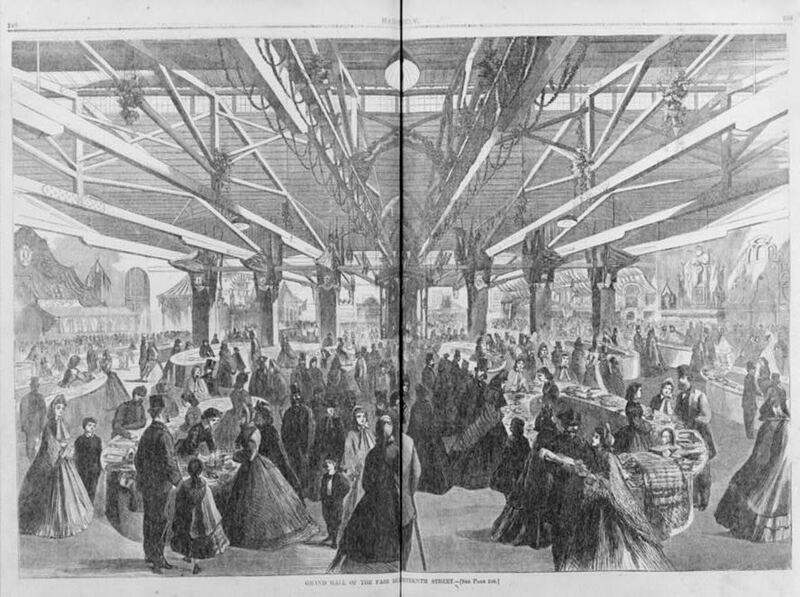 In a manner similar to the great industrial expositions, large temporary buildings were often constructed as the sites for many of the major fairs. Funds were raised through admission fees, lotteries and refreshment rooms. All aspects of business were represented in the fairs. Commemorative and ceremonial objects were designed by many companies and were sold or auctioned during fair rallies. The arrangement of the New Jersey Department at the New York Metropolitan Fair was under the artistic direction of the artist Jasper Cropsey and featured a variety of industrial production ranging from printing to household manufacture. The staggering organization of the large fairs incorporated a wide diversity of entertainments, demonstrations, and exhibitions. Items of every sort were donated for the fairs as sale merchandise. Large tables were arranged throughout the Grand Halls and presented an eclectic grouping of contributions from communities all over the New York area including Westchester, Harlem and Norwalk, CT. The items for sale, such as patriotic memorabilia, souvenirs made by soldiers, porcelain, glass, books, musical instruments, personal and household accessories, produce, flowers, toys and saddlery cluttered the displays. Female Commission volunteers wearing regulation costume were stationed at each table and encouraged sales, relying on patriotic fervor. Proceed to The Medical Demand.